So you may have heard the phrase freehand tattoo and wondered what it was. Freehand tattoos are the ultimate in custom tattooing. These tattoos are definitely one of a kind since they are fitted to your body and the odds of any artist creating the exact same thing the exact same way are slim to none. There are a couple different forms of freehand tattooing. The first form is absolute freehand. This is the most risky form, but there are a very select few that can carry this off well. Absolute freehand tattooing is the act of doing the tattoo without any reference marks at all on the skin. We recommend that you seriously research your tattooist before letting them do anything like this. It is a form for only the most experienced tattooer. 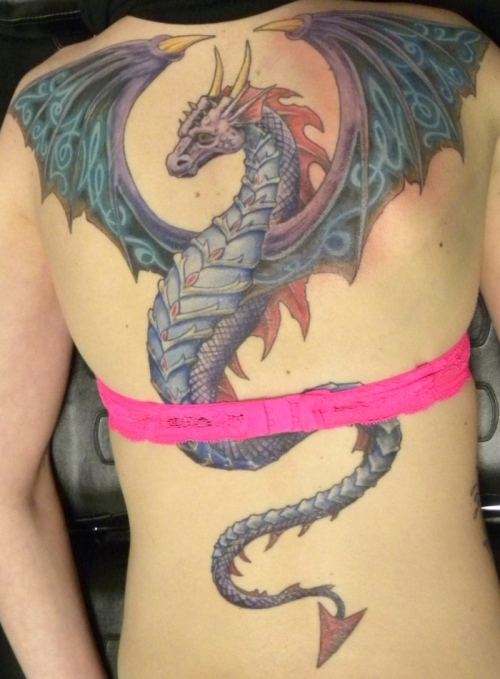 The other form of freehand tattooing is to draw the tattoo on the skin prior to tattooing it. This can be an excellent way to do larger pieces as well as a great way to get the tattoo to fit the body better. Here are some photos of this process. #1: The tattoo is sketched onto the skin in a lighter color. #2: It is then refined with a step darker color. #3: We then go in and refine it the rest of the way with a much darker color. #4: The tattoo outline is then applied. #5: Followed at a later date by the color and our completed tattoo. So now that you know what a freehand tattoo is there is nothing to be afraid of as long as you've done your research on the artist.